4-Word Review: Playing with dart guns. A new fad has caught on at a nondescript college campus where students play an assassination game by killing off other students with dart guns. The one who assassinates the most while still surviving wins. Alex (Robert Carradine) who writes for the school newspaper decides to do an expose on the game in an attempt to better get to know its star player Susan (Linda Hamilton). Unfortunately for them the game’s 5-time champion Gersch (Bruce Abbott) has gone over to the dark side and now using real bullets in his gun. As the game whittles down to just Susan and Gersch the tension mounts for her to catch on to his murderous plans before it is too late. For a low budget film with only the most modest of settings this thing isn’t too bad. The dialogue is snappy and the story proceeds at a good pace. The opening credits, which is a parody of the ones done on James Bond films is cute and it’s great to see Linda in her official film debut playing the same type of strong-willed female that brought to greater prominence in The Terminator franchise. Carradine is good too as her awkward suitor and the fact that this film plays against sexual stereotypes by having the male in more of a passive role is refreshing. 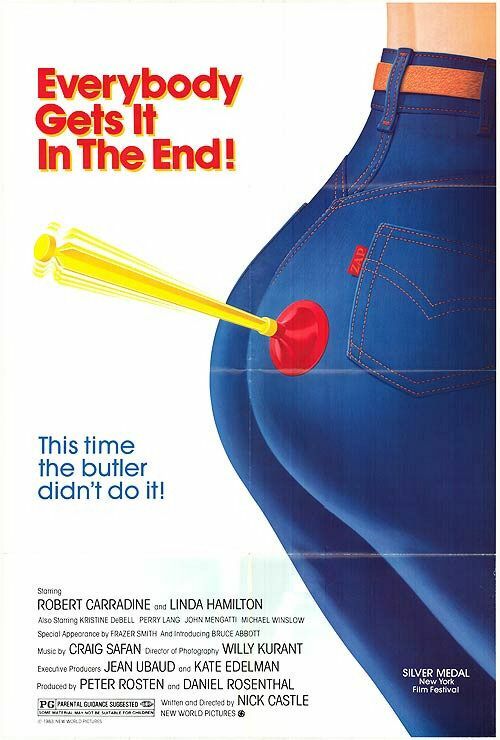 The film’s playful parody and the way the players take this silly game so very seriously is funny and having the second half shift to more of the conventional ‘psycho-on-the-loose’ plot made it less original and more formulaic. I understood why Gersch kills the first player using a real bullet, but was confused why he would keep on killing them and not go back to just using darts. He could’ve still retained his champion title and passed off the first killing as being possibly just an accident, but by continuing to kill people and harboring their corpses in the closet of his room was clearly going to lead to an eventual long jail sentence that even the craziest of persons could see coming. It also might have been more interesting had the identity of who was using real bullets was kept a mystery until the end. Even with these drawbacks I still found myself entertained and the film has strong cult potential for fans of low budget 80’s flicks. It’s also interesting to note that Hamilton and Abbott, who first met while filming this, later ended up getting married and having one child. This entry was posted in 80's Movies, Action/Adventure, Black Comedy, College Life, Cult, Low Budget, Obscure Movies, Parody and tagged Bruce Abbott, Entertainment, Linda Hamilton, Movies, Review, Robert Carradine. Bookmark the permalink. I never heard of this movie before. There are some familiar names in this too. I’ll have to check it out.